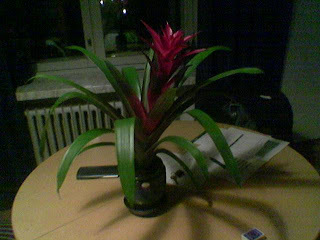 The bromeliad had been a nice gift, but it was fast becoming an eyesore. Through no fault of its own, Ishtar had come to see it as a reminder of its giver. He—it’s not important exactly who he is or what he did. He was gone, now. And this tropical plant on her kitchen table was a burden, but one she couldn’t bring herself to get rid of. Nobody could take care of it better, there was no place it would look better, and there was no place she would rather have it – except out of her heart. If it weren’t for him…but then, what had happened was in the past. For a time it had been good. It was always like that—were these pangs of loneliness and periods of recovery really worth it? Ishtar ordinarily thought so, but from within one of those times, it looked different. Then again, those times were starting to feel ordinary, weren’t they? It wasn’t just his fault, it was hers too. She'd trusted him when she shouldn't have. She’d made a new life in a new place, and he was the only thing she’d had. Unlike the life she’d left behind, she hadn’t established friendships in this city, and it was a hard place to meet people, sometimes. At least, the sort of people that interested her. She could have sworn that this place was an unending suburb, there was so little going on at night, there seemed to be so few people who weren’t in families—or at least who hadn’t been at some point. The list went on. The generation and lifestyle Ishtar identified with was nowhere to be seen. It wasn’t just that, though. This place didn’t feel like home, her family was not there, not even any relatives. Really, all she had was the bromeliad now, which of course brought her back to him. Ironic that the last living companion she had, plant though it was, was a result of being left by the only person she had had. Obviously she wasn’t over that relationship yet, but she had barely understood when it had ended. What a frustrating man, just dropping out of contact like that; she’d been worried sick. And once she’d learned in a roundabout way what was going on, she had been fuming mad. But rage had passed to sadness, a realization that she, Ishtar, was alone. No one was going to come rescue her; there wasn’t even anyone to hug her. Really there had never been any rescues in her life, nor had she ever fantasized about them, but she was starting to feel like she might need one. It wasn’t a white knight she was looking for – the trouble was simply that she’d never been this depressed for this long. Her life had already had its share of sorrow, considering her relative youth, but this last stint of heartache was more…complicated. How could someone even know what they should feel about you if you just dropped off the face of the earth? It was like this spiky plant, whose colors gradually ranged from deep green spiny pineapple leaves at the base to bright red spiny pineapple leaves that passed for petals. Several tongues of flame leapt mildly out the end. That had been the development of that relationship – it was impossible to say where the flower itself ended and the stalk began. And when it finally became clear, she had been a leaping tongue of flame and anything but mild, but her anger had come too late to mean anything. It was an amazing plant, Ishtar thought, and she remembered when she’d first seen one. It was in a conservatory back home, and several of them had been placed in one area, each unique in its colors. One had been bright fuschia, ranging to an earthy green at its base. Another had been much like the one on her round kitchen table, but larger. The others had impressed her less, but were interesting in their own rights. There had also been similarly odd plants that held water nearby, also bromeliads, also pineapple like, but with a core that seemed to be rotted out, replaced with the sort of watery hole that would have bred mosquitoes. Ishtar had shuddered at the sight of it, and did so again as she remembered. She’d only been thinking about the pretty ones. She had just come back to her apartment and looked over to see the plant there, dimly illuminated by the room’s sole fluorescent light, pale in the night. The window was dark and the lights of a house across the street could be seen, but nothing else. To Ishtar, it would have been nice if she could see as much in her future as she could out the kitchen window. Bills were looming on the table and her phone sat there, inert, no calls for days. And the keys beside the bromeliad reminded her that her car might have been dying. There was always hope, she told herself, hard though it was to see. She wasn’t really buying that. Her heart wasn’t even where she was. It was trying to be off somewhere else, somewhen else. And try as it might to find a better time to be in, it couldn’t quite get there. Seeking some companionship from an unmoving plant, Ishtar touched its leaves and said to it, “At least you’re not going anywhere.” She forced herself to smile – supposedly it could help, if you were feeling down. Maybe it helped a little…but the plant was a living thing, and she was happy to have that, at least. Well, tomorrow was coming too soon already; the trouble of working late to make up for lost cash. Ishtar decided to have a shower – no time for a bath – and then go to sleep, the only place where she could forget about the world, at least for a short, forgotten time.